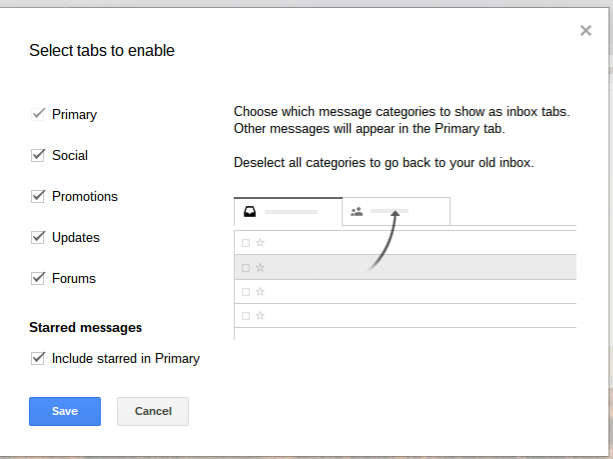 Some time ago Gmail introduced a tabbed inbox, including Primary, Social, Promotions, Updates, and Forums. The idea behind the tabs was to automatically categorize your emails into the type based on predetermined Google algorithms. Did you know that you can turn some, or all, of these off? There are essentially three ways to turn off, or deactivate, the tabs. The first method can be accomplished right from the inbox itself. At the end of the list of tabs there is a plus sign (+). Just click the plus sign and you will be given the tabbed options. As seen here. You can uncheck any or all to remove the tabs. Do not worry, as removing the tab will not delete the email, it will just place the email into the Primary tab. The second method will get you to the same point, but requires you to go into Gear Icon menu and select the Configure Inbox. The third method, results in similar options, as above, however you will be given a couple of more settings you can select. Go into Gear Icon menu and select settings. Under settings you will select the Inbox heading. Here you can select any, or all, of the tabs as well as choose settings for filter overrides and choosing whether or not to show importance markers.